Atheneum/Caitlyn Dlouhy Books, 9781481415910, 432pp. 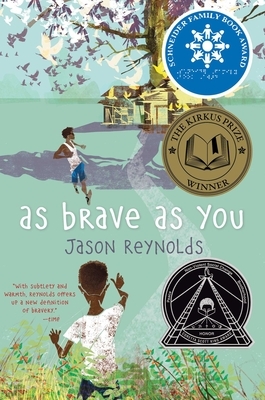 When two brothers decide to prove how brave they are, everything backfires—literally—in this “pitch-perfect contemporary novel” (Kirkus Reviews, starred review) by the winner of the Coretta Scott King – John Steptoe Award. Genie’s summer is full of surprises. The first is that he and his big brother, Ernie, are leaving Brooklyn for the very first time to spend the summer with their grandparents all the way in Virginia—in the COUNTRY! The second surprise comes when Genie figures out that their grandfather is blind. Thunderstruck, Genie peppers Grandpop with questions about how he hides it so well (besides wearing way cool Ray-Bans). How does he match his clothes? Know where to walk? Cook with a gas stove? Pour a glass of sweet tea without spilling it? Genie thinks Grandpop must be the bravest guy he’s ever known, but he starts to notice that his grandfather never leaves the house—as in NEVER. And when he finds the secret room that Grandpop is always disappearing into—a room so full of songbirds and plants that it’s almost as if it’s been pulled inside-out—he begins to wonder if his grandfather is really so brave after all. Then Ernie lets him down in the bravery department. It’s his fourteenth birthday, and, Grandpop says to become a man, you have to learn how to shoot a gun. Genie thinks that is AWESOME until he realizes Ernie has no interest in learning how to shoot. None. Nada. Dumbfounded by Ernie’s reluctance, Genie is left to wonder—is bravery and becoming a man only about proving something, or is it just as important to own up to what you won’t do?